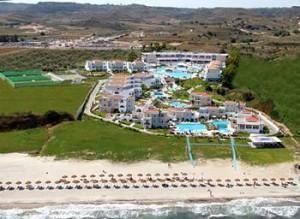 This hotel is a five-star complex located in the area of Mastichari and right on the beach. The design and architecture is outstanding, and gives the appearance of a small village. It was built in 2004 in stunning Aegean design, and occupies 50,000 square meters overlooking the sea. There are main buildings, plus bungalows built in villa-style, and all are beautifully set amid lovely landscaped gardens, with an outstanding 5,000 square meter complex of swimming pools. In total, the hotel offers 232 guest rooms, 84 bungalows, and 35 suites. Room amenities include direct-dial telephone, color satellite/cable TV, minibar, safe box, individually controlled air conditioning, private bath and hairdryer, plus balcony or terrace. Furnishings are colorful and contemporary. In addition to the 5,000 sq. meter complex of swimming pools, there are children’s pool and playground; pool bar and snack bar; outdoor Jacuzzi; organized beach with beach bar; Fitness Center with /Sauna, Jacuzzi, Hammam, Massage treatments, and Vitality Pool; 2 tennis courts; squash court; table tennis and darts. Dining options include the Main Restaurant for the Buffet Breakfast and Dinner; a each Taverna; snack bar at the pool; and for drinks, there's the Main Bar and Piano Wine Bar. The complex has a Mini Market, a Gift Shop, and a Hairdresser. Animation Program for adults and children. The Marmari Palace Hotel is located in the area of Mastichari, four kilometers from the airport, and 17 kilometers from Kos Town.